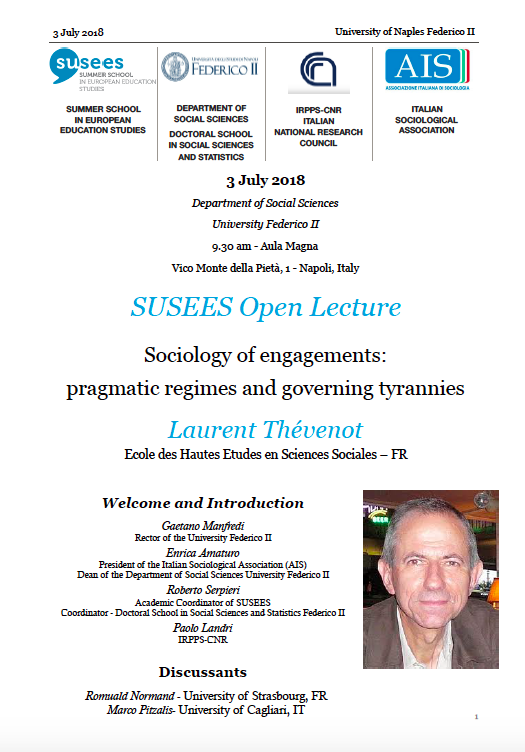 On 3rd July 2018, Laurent Thévenot, Director of the Ecole des Hautes Etudes en Sciences Sociales, FR will give a SUSEES Open Lecture on ‘Sociology of engagements: pragmatic regimes and governing tyrannies‘, as part of the didactic activities of the 2018 edition of SUSEES. The Open Lecture will be held at 9.30am at the Department of Social Sciences of the University of Naples Federico II, Vico Monte della Pietà, 1 – Napoli. The Lecture will be introduced by Gaetano Manfredi (Rector of the University Federico II), Enrica Amaturo (President of the Italian Sociological Association), Roberto Serpieri (Academic Coordinator of SUSEES) and Paolo Landri (IRPPS-CNR). Romuald Normand (University of Strasbourg) and Marco Pitzalis (University of Cagliari) will start the debate as official discussants.